It all started in the late 70s during the 'German Autmn', when policemen entered Berlin's art academy UDK and devastated several studios of the art students. Among them was Berlin-born Olaf Metzel – at that time with a major focus on classic italian art. His interests and forms of expressions changed after that event: he chose vandalism and documented the selective destruction via video. 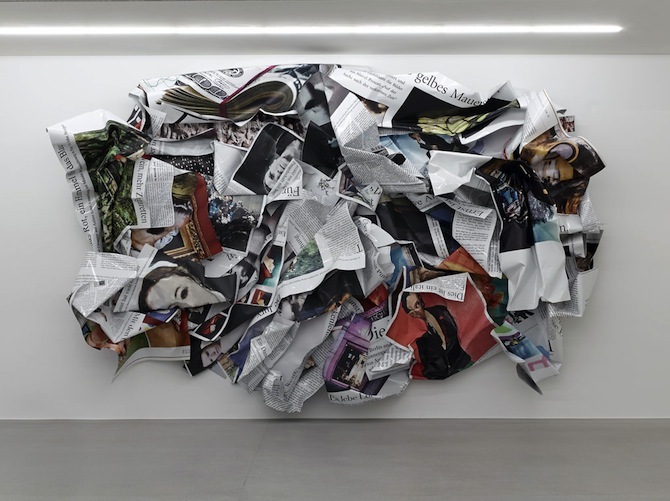 Contrary to many artists, who have unsuccessfully tried to provoke, to appeal for revolution or who miscalculated their audience's economy of attention, Metzel managed several times to cause an outrage. There is always a taste of riot surrounding his art. His public sculpture "Turkish Delight" (2007) in Vienna for example, which showed a naked girl wearing a headscarf, was tipped over and caused a massive amount of hate mails. In 1987, Metzel placed the public work "Randale-Denkmal", consisting of steel barriers and supermarket trolleys, at Joachimsthaler Platz in West-Berlin – exactly the spot where policemen and protesters clashed many times. After conservative dissenting votes, the work was relocated to an industrial party area in the former east. 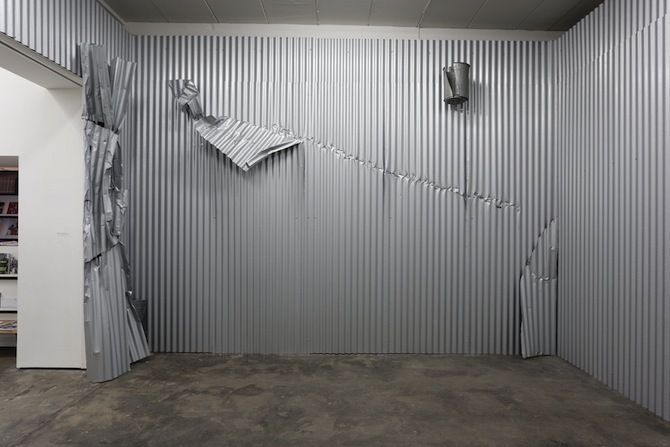 Metzel now lives in Munich and holds a professorship in sculpture at the art academy, while occasionally returning to his hometown to participate in exhibitions. 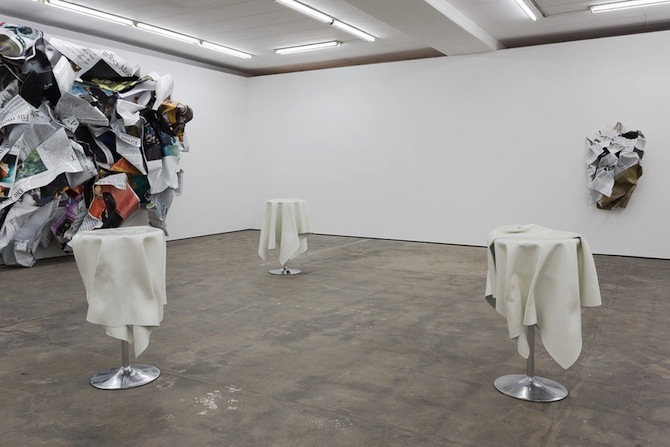 His work, however, is no less political than it was in the 80s: Currently on display at Galerie Wentrup in Berlin, Metzel presents two installations that are dedicated to extreme oppositions of the art world and the reality outside the institutional white cube. The center piece "Gelbes Mauerstück (ein Apfel für das Rot…)" (2012) is very insistent in foregrounding the infinite chain of material: text and object, sculpture and painting, critique and creativity. Four times six meter large, a giant paper ball is attached to the wall. 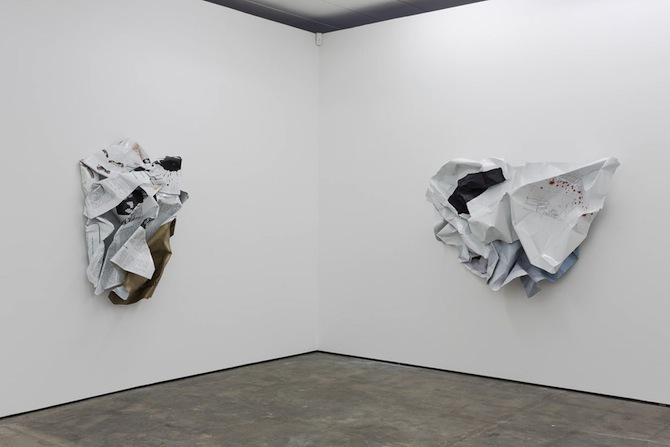 The object is made of folded aluminum and carries scrunched-up newspaper prints of reviews about the art of Leonardo Da Vinci, Cézanne and Lucian Freud. One might wonder: Anger, or deliberate meta-reflexivity? A work of art criticising art criticism? 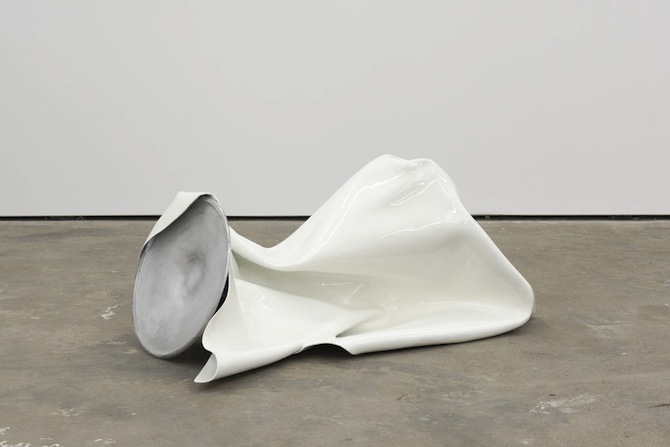 Yes and no – there is more to this work: The title is borrowed from a line of Marcel Proust's classic In Search of Lost Time, which repeatedly discusses paintings along fine descriptions of perception. 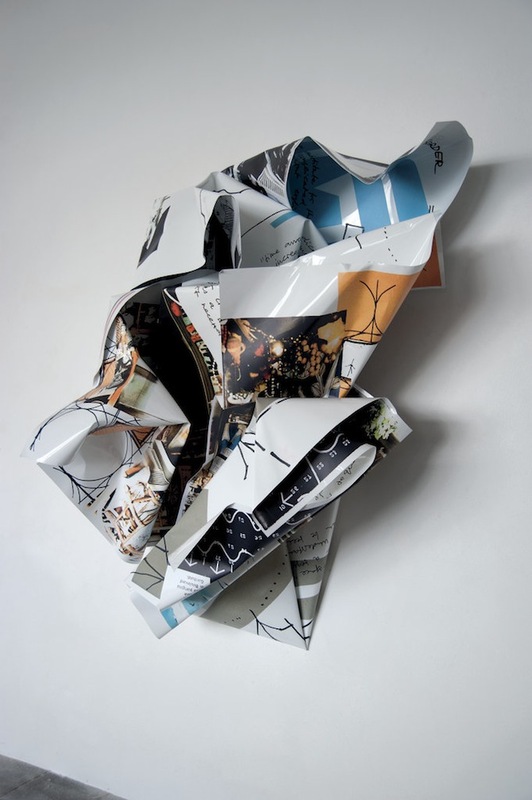 Metzel's work also includes a scrunched-up book review about the literary motif of art in Proust's writings, which again includes a picture of the very wall-sculpture. "Gelbes Mauerstück (ein Apfel für das Rot…)" thus demonstrates a closed circle: critique reviews art and art reviews critique. 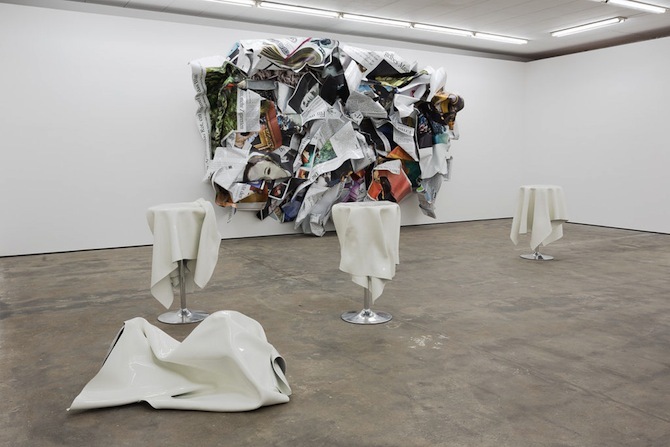 The oppositional approach towards an elitism in the art world really first comes to light in juxtaposition with five bar tables, covered by white aluminum blankets, which are placed in front of the large wall sculpture. "Flying Buffet I-V" (2014) seems to humorously stage, what Metzel can stage best: a clash. 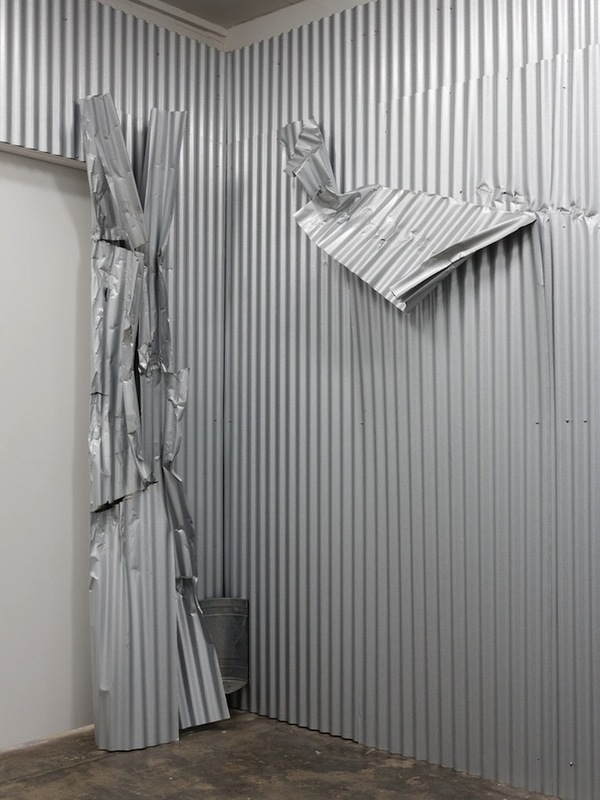 This sort of clash does not happen in his second installation, which is placed in another room of the gallery, but it rather reminds of a misplaced stage stetting: "Sammelstelle" – previously shown in 1992 at Kunsthalle Hamburg and in 2013 at Kunstverein Hamburg – intends to transform the white cube into a junkyard. 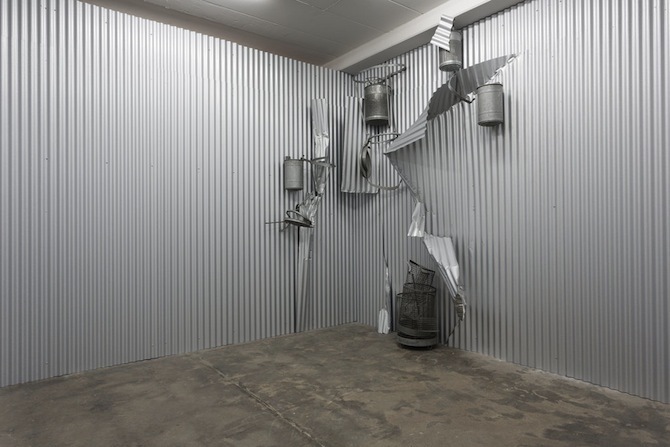 Corrugated metal covers the walls, rubbish bins adorn the corners, the floor is empty. "Sammelstelle", which could be translated into collection point, refers to the uncomfortable atmosphere, the hopelessness of asylum homes. Affecting the physical sensation, the space creates a feeling of imprisonment and powerlessness. Eventually, however, this work remains within the institutional walls of a gallery. Amongst those who will be seeing it, the installation will not cause a clash, nor an outrage, but rather applause.